NAPLES -- Elena Ferrante’s Neapolitan Novels, a four part series, translated into English by Anne Goldstein and published by Europa Editions (New York) have achieved international success and renewed interest in this southern Italian city. Readers around the world followed the intricate collage of events spanned over 60 years alongside the two female protagonists whose lives are shaped by their social milieu, sexual and intellectual jealousy and vicious competition in a story divided into four volumes: My Brilliant Friend, The Story of a New Name, Those Who Leave and Those Who Stay, and The Story of the Lost Child. Fans can sit tight, now. Their story doesn’t need to end. Now visitors to Naples can embark on a unique guided tour to the very heart of the pulsating places that marked the upbringing of Elena and Lila. Originally intended as a book about the difficulty of an old woman who tries to erase herself and completely disappear off the face of the Earth, the introduction of an inseparable childhood friend was to complicate the author’s story irreparably. Ferrante’s fascinating and gripping idea shows how two girls seek to find their ways out of their humble Neapolitan origins into adulthood and old age, be it by marriage or through a university education. Both biographies are told with deep insight into each woman’s personal struggles as well as into the tough reality of Naples and Italy during the long 20th century. The series even addresses several main social/historical themes like class conflict, the role of literature and the social responsibility of the writer amidst social upheaval and within protest movements, the changing conditions of women in the 1070s, early computerization and the Italian factory strikes of the 1970s. As an admirer and scholar of Ferrante works, journalist and literary critic Titti Marrone of southern Italy’s leading newspaper Il Mattino studied the tetralogy thoroughly, creating and certifying the tour. Until mid-December 2016, tourists can relive the story of Lenù and Lila by visiting some of the most lively and authentic corners and niches that shaped their lives. Romeo, a 5 star luxury hotel, located just outside the Naples Port Authority and meters away from the Naples City Hall, offers tourists an exciting experience, far from conventional tourism: two nights in one of the hotel’s comfortable rooms complete with a guided tour of Naples and an evening appointment with a delicious tasting menu of Neapolitan Cuisine. Winding around the city’s narrow streets by private car and visiting the places where Elena and Lila spent time throughout the four volumes of the series, tourists discover the most suggestive and secret corners of Naples. In the company of an expert guide, the tour begins in Rione Luzzatti, complete with brief illustrations of the places described in the novels. Tourists are immediately immersed into the two friends’ neighbourhood and get a quick idea of the degraded and desolated area. Winding through Piazza Garibaldi, Corso Umberto, Via Depretis and Piazza Municipio, the private car stops in Piazza del Plebiscito. From there, the tour proceeds on foot in Via Chiaia, arriving in Piazza dei Martiri and in Piazza Vittoria. Once again by car, the tour continues along the breathtaking waterfront in Via Caracciolo and, crossing Viale Gramsci, Piazza Sannazaro and Via Mergellina, the ride takes tourists up Via Orazio and stops on belvedere to admire the view, finally winding down the road again from Via Posillipo. Entitled “My Brilliant Naples” (La Napoli Geniale), the tour lasts a total of five hours. Included in the package, Michelin star Chef Salvatore Bianco will delight guests later in the evening with a special “Elena Ferrante” tasting menu, created by the chef himself in an effort to best represent local gastronomy products and Mediterranean culinary tradition that are emphasized in the books. Guests will enjoy two fun filled days that translate into a highly suggestive unique literary journey for Ferrante lovers and allow them an unforgettable experience, which will be forever impressed on their hearts and minds. The novels have attracted fame by receiving several recognitions. 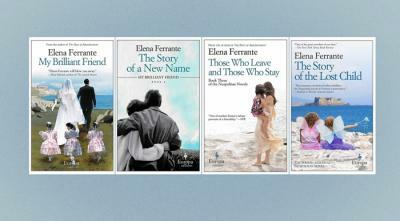 My Brilliant Friend was long listed at the International IMPAC Dublin Literary Award in 2014. The Story of the Lost Child was nominated for the Italian Literary Strega Prize in 2015 where it came in third place. In 2015, The New York Times identified The Story of the Lost Child as one of the ten best novels of the year and Time has now elected Elena Ferrante one of the 100 most influential people worldwide. In February of this year, Italian producer Wildside for Fandango Productions announced that the four novels would be coming to the small screen. The new TV series called Neapolitan Novels, with the participation of the author for its TV adaptation, will be broadcast in a total of 32 episodes. The series is being produced for the international market, though when the programme will air and on which channel are still to be announced. With all the fame and international success, Ferrante’s identity still remains a mystery. She/he never makes book presentations or speaks in public to promote the series. Considering the books’ success, it’s quite a feat of anonymity. Using a pseudonym to disguise her (or his) identity, many have hypothesized or spent lengthy time investigating the author’s true identity to no avail. Those lucky enough to interview her have had to resort to the mediation of Italian editors Sandro Ferri and Sandra Ozzola from E/O, patiently waiting for questions and answers to be sent back and forth by mail. Until now, only Europa Editions has had the honour of an in-house interview with the author that was published for The Paris Review Magazine in its Spring 2015 issue.